Columbia College, a seat of learning in the city of New York, originally called King's college. The institution comprises an academic department, law school, medical school, and school of mines. The government of the college proper is vested in 24 trustees. Besides the president, there are 9 professors and 2 tutors. The professorships are: 1, Greek language and literature; 2, German language and literature; 3, chemistry; 4, mathematics; 5, mathematics and astronomy; 6, philosophy and English literature; 7, mechanics and physics; 8, Latin language and literature; 9, evidences of natural and revealed religion. Each student is required to devote fifteen hours a week to scholastic exercises. During the senior year eight hours a week are assigned to required and seven hours to elective studies. The elective studies are Greek, Latin, physics, calculus, psychology, technology, and organic chemistry; two hours a week are allotted to each of the four first named and three hours to each of the others. The course of study is four years, at the end of which period the degree of bachelor of arts is conferred upon those students who have passed successful examinations. The academic year, which is divided into two terms, begins on the first Monday in October, and closes with commencement day on the last Wednesday in June; there being a vacation of. two weeks about Christmas. There are two publie examinations annually of all the classes, one in February, and the other at the close of the academic year. Private examinations are held monthly in all the classes, and there is an examination for honors at the end of each year, open to members of the senior class. The annual tuition fee is $100; by a vote of the trustees this charge may be remitted to indigent students. In 1873 the number of students thus receiving instruction free was 24. Prizes amounting to $450 are annually awarded upon examination for proficiency in Greek; in German, $100; in studies relating to theology, $50; and "to the most faithful and deserving student of the graduating class," $50. By means of free scholarships established by the college, certain societies and corporations, including each religious denomination in the city of New York, may send students to be educated free of charge. By a recent resolution of the board of trustees, twelve scholarships have been established of the annual value of $100 dollars each, and two fellowships of the annual value of $500 each. The fellowships are one in science and one in literature, which are open to competition by the senior class. The fellows are required to continue their studies for three years wherever they may choose, but under the direction of the president of the college. The law school was opened in 1858, since which time 930 students have graduated. The plan of instruction combines the study of selected text books with lectures. There are four professors, viz. : of municipal law, of constitutional history and public law, of ethics, and of jurisprudence and medical jurisprudence; and lectures are also delivered by prominent members of the New York bar. The course of study occupies two years, and a third year, or postgraduate course, has been organized for those students who may desire to pursue their studies beyond the regular course. Two moot courts, with a professor as presiding officer, are held every week of the term, at each of which a cause previously assigned is argued by six students. The term commences on the first Wednesday in October, and continues till May 15. Three prizes, aggregating $500, are annually awarded upon examination to such students as shall have attained the highest excellence in their respective classes. The tuition fees are $100 a year. The degree of LL. B. is conferred upon those students who have pursued the entire course of study, and have passed the requisite examination. By the provisions of an act of the legislature of New York, graduates of this law school are admitted to practice in all the courts of the state on receiving the college diploma. - The school of mines was established in 1864, and in 1873 had 21 professors and instructors. The course of instruction occupies three years. Those who complete it receive the degree of engineer of mines, civil engineer, or bachelor of philosophy. There is a post-graduate course of one year for the degree of doctor of philosophy, and a preparatory course for candidates not qualified to enter the first year. The year is divided into two sessions. The first commences on the first Monday in October; the second on the 16th of February. The lectures close on the last Friday of May, and are followed by an examination on the studies of the year. There are five parallel courses of study: 1, civil engineering; 2, mining engineering; 3, metallurgy; 4, geology and natural history; 5, analytical and applied chemistry. The plan of instruction includes lectures and recitations in the several departments of study; practice in the chemical and metallurgical laboratories; projects, estimates, and drawings for the establishment of mines, and for the construction of metallurgical and chemical works; reports on mines, industrial establishments, and field geology. Written and oral examinations are held at the end of each session. During the vacation, at the close of the first and second years, students are required to prepare and submit memoirs on subjects assigned to them by the faculty, and journals of travel, containing descriptions of mines and metallurgical or chemical works visited, and any interesting mineralogical or geological observations they may have made. The fee for the full course is $200 a year for each student; but those unable to pay may be admitted without charge. The library contains more than 2,000 volumes of works on science, besides the current literature of Europe and America relating to science. The various cabinets include 500 crystal models; 10,000 specimens of minerals; a complete collection of metallurgical products, illustrating the different stages of the typical processes in use in the extraction of each metal in Europe and America; an extensive collection of models of furnaces; several thousand specimens of materials and products, illustrating applied chemistry; and a geological collection embracing over 60,000 specimens. - The total amount invested by Columbia college for purposes of instruction is $591,850, in addition to which it owns real estate and personal property amounting to $4,184,426. The college debt in 1872 amounted to $1,240. The income for the year ending Sept. 30, 1872, was $240,405 12, and the expenditures were $172,240. The medical school is not included in these returns. The general library of the college in 1873 contained 16,364 volumes; law library, 3,860 volumes; library of the school of mines, 2,140 volumes; botanical library, 1,000 volumes. The herbarium, presented to the college by Dr. John Torrey, is valued at about $15,000, and the chemical and the philosophical apparatus at nearly $100,000. According to the triennial catalogue of 1870, the total number of graduates of all the schools was 3,834, of whom 2,721 were living. There were 2,109 graduates in arts, 868 in medicine, 487 in law, 37 in mining, and 333 honorary graduates. In 1873 there were 123 students in the academic department, 371 in the law school, 136 in the school of mines, and 359 in the medical school. - In 1746 an act was passed by the colony for raising £2,250 by lottery "for the encouragement of learning, and toward the founding of a college." By other similar acts this sum was increased in 1751 to £3,443, and vested in ten trustees, one of whom was a Presbyterian, two were of the Reformed Dutch communion, and seven were Episcopalians, some of whom were also vestrymen of Trinity church. In 1753 the trustees invited the Rev. Dr. Samuel Johnson, of Stratford, Conn., to become the president of the proposed college. The royal charter constituting King's college passed the seals Oct. 31, 1754, but the organization of the college under it was not effected till May 7, 1755, when the charter was presented by Lieut. Gov. De Lancey to the persons named in it as governors of the college, who consisted of the archbishop of Canterbury, the principal civil officers of the colony, the principal clergy of the five religious denominations in the city, and 20 private gentlemen. Money was collected in England, and books were sent out. The college, however, had opened July 17, 1754, with a class of eight, under Dr. Johnson's own instruction, in a vestry room belonging to Trinity church. The corner stone of the college building was laid Aug. 23, 1756, on the block now bounded by Murray, Church, and Barclay streets, and College place, and intersected by Park place. An English traveller described it as facing the Hudson, and being "the most beautifully situated of any college in the world." On June 21, 1758, the first commencement was held, when 10 bachelors and as many masters of arts were graduated. The students began to lodge and mess in the college building in May, 1760, and on June 26 the procession moved from there to St. George's chapel to hold the third commencement. At Dr. Johnson's request, the Rev. Myles Cooper, fellow of Queen's college, Oxford, was sent out in 1762 by the archbishop of Canterbury, and appointed fellow of the college, professor of moral philosophy, and to assist the president in instruction and government, with the understanding that he was to succeed him, which he did the following year. In 1767 a grant of land was made to the college of 24,000 acres, which was subsequently lost in consequence of lying in that part of the colony afterward set off to constitute a portion of Vermont. The instruction appears to have been conducted by the president and three tutors or professors, who were always able men, till 1767, when a faculty of medicine was created, consisting of six professors of great eminence. The chief studies were natural law, physic, logic, ethics, metaphysics, mathematics, natural philosophy, astronomy, geography, history, chronology, rhetoric, Hebrew, Greek, Latin, modern languages, and the belles-lettres. To the college was also annexed a grammar school for the due preparation of those who proposed to complete their education in the arts and sciences. Dr. Cooper was a strong loyalist, and had a pamphlet controversy with his pupil Alexander Hamilton. At length his politics became so obnoxious that the college was attacked by a mob in the night of May 10, 1775, and he was obliged to flee for his life. Six days after his escape the Rev. Benjamin Moore, afterward bishop of the diocese, was made president pro tern. In 1776 the college was ordered by the committee of safety to be prepared for the reception of troops. The students were dispersed, the library and apparatus deposited in the city hall, and in consequence lost, and the building became a military hospital. Six hundred volumes were recovered 30 years after in a room in St. Paul's chapel, their existence having been known only to the sexton. The library had received, among great numbers of valuable presents, a copy of every work from the university press of Oxford. This state of things continued for eight years. In 1784 regents of a state university were appointed, of which the governor, Clinton, was chancellor, who demanded and received what property belonged to King's college, the name of which was changed to Columbia college by the same act which gave them the power. The regents organized four faculties: a faculty of arts, with seven professors; one of divinity, with such professors as might be established by the different religious societies within the state; a faculty of medicine, of seven professors; and one of law, of three. Besides all these, there were to be nine extra professors, a president, secretary, and librarian. For several years there was no president, his duties being discharged by the professors in turn. There were no funds to carry out the scheme of the regents. In 1787 the original charter was confirmed to Columbia college, and it was placed under the care of 24 trustees. These held their first meeting May 8, 1787, and on the 21st elected William Samuel Johnson, LL. D., son of the first president, and one of the most eminent lawyers and statesmen of the day, as president. In 1792 there was a full corps of professors, including one of oriental languages, one of natural history, chemistry, agriculture, and botany, occupied by Dr. Mitchill, and one of law, by James Kent. Dr. Johnson resigned in 1800, and was succeeded by the Rev. Dr. Wharton of Philadelphia. It is believed, however, that Dr. Wharton never entered upon the duties of the office. From this period the president took no part in the instruction, but exercised only" a general supervision; and under this arrangement Bishop Moore accepted the presidency, Dec. 31, 1801. He did not reside in the college, nor on ordinary occasions take part in the discipline. In 1810 a new charter was obtained. In June, 1811, Bishop Moore having resigned, the Rev. William Harris was elected president, and the Rev. Dr. John M. Mason provost, the statutes of the college having been altered for the latter purpose. In 1812 Dr. Mason was also elected a trustee, a previous act of the legislature allowing it having been obtained. He was one of the most learned of the clergy of his time, and distinguished for the life and interest which he gave to the exercises of the lecture room. On Nov. 1, 1813, the medical school was incorporated with that of the college of physicians and surgeons. Dr. Mason resigned in 1816, and the office he held was discontinued. In 1817 the college received from the state the gift of the botanic garden ground, and a little after a grant of $10,000. In 1823 the Hon. James Kent delivered the course of lectures which were the basis of his celebrated commentaries. Upon the resignation of President Harris in 1829, William A. Duer, LL. D., was made president. He resigned in 1842, and was succeeded by Nathaniel F. Moore, LL. D., who was succeeded in 1849 by Charles King, LL. D. In 1830 the college opened a "scientific and literary course," accessible to others besides matriculated students, and professors were appointed in engineering, analytic chemistry, and other branches. This course was discontinued in 1843 for want of patronage. The power to endow and nominate to new professorships was extended to religious bodies and individuals, and some 20 free scholarships were constituted, to be in the gift of various religious and civil corporations in the city. In 1843 a professorship of German was founded by a bequest of $20,000 from Mr. Frederick Gebhard. 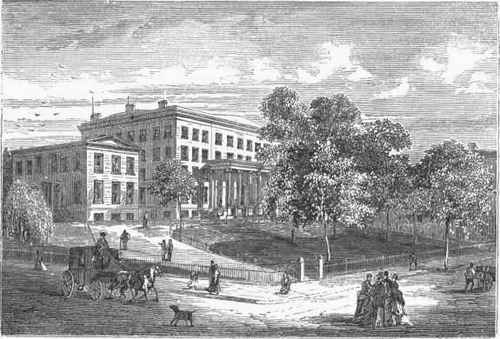 In 1857 the college was removed to its present location in 49th street, the building formerly occupied by the institution for deaf mutes being fitted up for that purpose. The college grounds comprise the block bounded by Madison and Fourth avenues and 49th and 50th streets. In 1858 the law school was opened in Lafayette place. From 1813 to 1860 there was no faculty of medicine; but in the latter year it was revived by the adoption of the college of physicians and surgeons as the medical department of Columbia college. This college is situated on the corner of 23d street and Fourth avenue. The connection, however, is little more than nominal, as the medical college is governed by an independent board of trustees. In 1864 President King resigned, and was succeeded by the Rev. Frederick A.P. Barnard, LL. D., who still retains the office (1873). In 1872 the college purchased at a cost of $375,000 nearly ten acres of land near 160th street, on Washington Heights, extending from the Boulevard to the Hudson river, as a possible future site of the institution.